Mohr's circle, named after Christian Otto Mohr, is a two-dimensional graphical representation of the state of stress at a point. The abscissa, , and ordinate, , of each point on the circle are the normal stress and shear stress components, respectively, acting on a particular cut plane with a unit vector with components . In other words, the circumference of the circle is the locus of points that represent the state of stress on individual planes at all their orientations,where the axes represent the principal axes of the stress element. Karl Culmann was the first to conceive a graphical representation for stresses while considering longitudinal and vertical stresses in horizontal beams during bending. 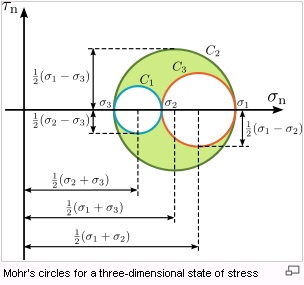 Mohr's contribution extended the use of this representation for both two- and three-dimensional stresses and developed a failure criterion based on the stress circle. There is also a similar Mohr's circle for strain where x-axis depicts strain and the y-axis represents half of shear strain which can be found out by Generalised Hooke's Law. Other graphical methods for the representation of the stress state at a point include the Lame's stress ellipsoid and Cauchy's stress quadric. Tensile stresses (positive) are to the right. Compressive stresses (negative) are to the left. Clockwise shear stresses are plotted upward. Counterclockwise shear stresses are plotted downward. The reason for the above sign convention is that, in engineering mechanics, the normal stresses are positive if they are outward to the plane of action (tension), and shear stresses are positive if they rotate clockwise about the point in consideration. In geomechanics, i.e. soil mechanics and rock mechanics, however, normal stresses are considered positive when they are inward to the plane of action (compression), and shear stresses are positive if they rotate counterclockwise about the point in consideration. 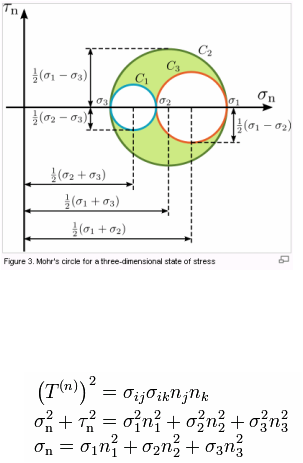 To construct the Mohr circle of stress for a state of plane stress, or plane strain, first we plot two points in the space corresponding to the known stress components on both perpendicular planes, i.e. and (Figure 1 and 2). We then connect points and by a straight line and find the midpoint which corresponds to the intersection of this line with the axis. Finally, we draw a circle with diameter and centre at . The following procedure is used to draw a Mohr's circle and to find the magnitude and direction of maximum stresses from it. 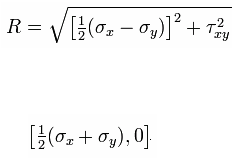 First, the - and -axes of a Cartesian coordinate system are identified as the -axis and -axis, respectively. Next, two points of the Mohr's circle are plotted. These are the points B (, ) and A (, ). The line connecting these two points is a diameter of the Mohr's circle. The first approach relies on the fact that the angle between two planes passing through is half the angle between the lines joining their corresponding stress points on the Mohr circle and the centre of the circle. In other words, the stresses acting on a plane at an angle counterclockwise to the plane on which acts is determined by traveling counterclockwise around the circle from the known stress point a distance subtending an angle at the centre of the circle . The second approach involves the determination of a point on the Mohr circle called the pole or the origin of planes. Any straight line drawn from the pole will intersect the Mohr circle at a point that represents the state of stress on a plane inclined at the same orientation (parallel) in space as that line. Therefore, knowing the stress components and on any particular plane, one can draw a line parallel to that plane through the particular coordinates and on the Mohr circle and find the pole as the intersection of such line with the Mohr circle. As an example, let's assume we have a state of stress with stress components , , and , as shown on . First, we can draw a line from point parallel to the plane of action of , or, if we choose otherwise, a line from point parallel to the plane of action of . The intersection of any of these two lines with the Mohr circle is the pole. Once the pole has been determined, to find the state of stress on a plane making an angle with the vertical, or in other words a plane having its normal vector forming an angle with the horizontal plane, then we can draw a line from the pole parallel to that plane . The normal and shear stresses on that plane are then the coordinates of the point of intersection between the line and the Mohr circle. 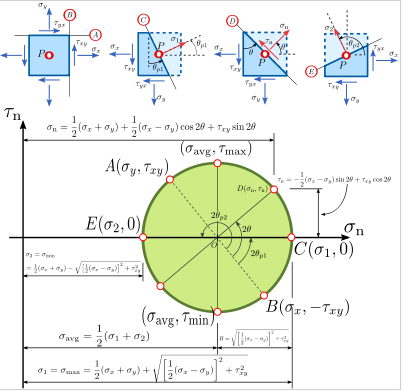 To construct the Mohr's circle for a general three-dimensional case of stresses at a point, the values of the principal stresses and their principal directions must be first evaluated.